If you use Micro-Blog like Twitter you should see many shorten URL there, how do you know real URL behind them? Sometimes we just waste time to click junk links, it is annoying when you found that link takes you to a junk site. To avoid this annoying you should to find a real URL before you click it. Long URL Please is an online tool for you. 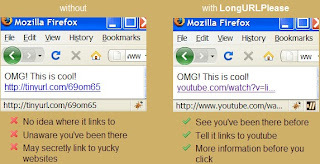 It is a Firefox extension, very easy to use. After you installed it you can easy to find real URL behind shorten URL. If you do not want install anything on your Firefox or use other browsers, it also offers a Bookmarklet that can be easy to add on bookmark bar. Just press this button on a page that contains shorten URL it will display original URL. Long URL Please supports some main shorten URL services like Bit.ly, Tinyurl, Is.gd, Su.pr, and other 70 shorten URL services.